CBRE, the commercial property and real estate services advisor, has won the British Council for Offices ‘Fit-Out of Workplace’ Award, Northern Region, for its design of the New Balance offices in Birchwood, Warrington. CBRE was commissioned by New Balance to design and manage its relocation to new offices and used the opportunity to create a stimulating and efficient work environment. 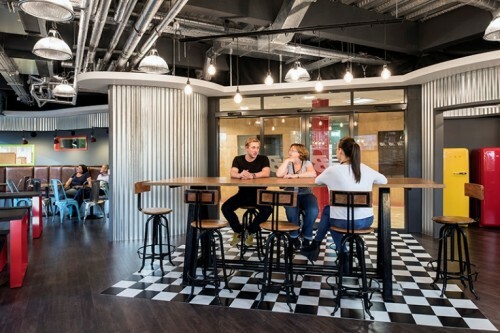 The fit-out transformed a conventional business park interior into a unique working environment which combines the company’s manufacturing heritage with its innovative nature. The brief demanded a unique design which provided a solution both in practical terms – primarily storage, display and handling of thousands of product items – and the company’s aspiration for a new type of work environment, which amongst other factors, would help to instil a feeling of pride in the staff. The new offices contain four large showrooms, product development spaces and meeting spaces, as well as a cafeteria and gym. The project was completed successfully within a very fast timescale and on budget, and has provided a high degree of staff satisfaction and increased workplace effectiveness. Reclaimed materials such as bricks, sports hall flooring, and oak boards, as well as individually-selected salvaged period furniture were used throughout, adapted to suit the themes of certain rooms. The desk system was also purpose-designed and manufactured locally using reclaimed oak.